WTM London 2016 registered a joint-record attendance of 51,500 and the highest number of exhibitor invitees and buyers in the 37-year history of the event. Despite low oil revenues, increased numbers of travel professionals from across the Middle East, participated in this year’s World Travel Market London 2016. 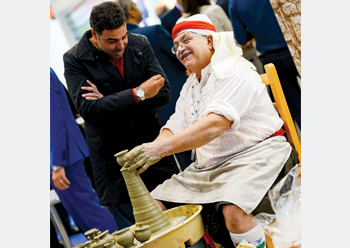 With Expo 2020 on the horizon, UAE exhibitors dominated as number of Middle East exhibitors grew by 2.26 per cent. Industry deals worth more than $3.07 billion was signed over three days. Some prominent new exhibitors from the Middle East included Saudia, the national flag carrier of Saudi Arabia and travel organisation – Alraqi from the Sultanate of Oman. Other key exhibitors included the tourism boards and associated partners from Dubai, Abu Dhabi, Sharjah, Ras Al Khaimah, Ajman, Fujairah, Dubai Parks & Resorts, Saudi Arabia, Qatar, Oman, Kingdom of Bahrain, Jordan, Lebanon, Iran Doostan, Kuwait Airways and Oman Air. WTM Buyers’ Club is the leading business club for senior travel industry decision makers with direct purchasing responsibility. The number of pre-qualified buyers from the WTM Buyers’ Club that attended the event stood at 9,714 – a 6 per cent increase on WTM London 2015. Total visitor numbers (excluding press, ministers, ministers’ aides and students) stood at 31,951 – a 5 per cent increase on WTM London 2015. World Travel Market London, Senior Director, Simon Press, said: 'WTM London has grown at an unprecedented rate in recent years making it the event where the industry conducts its business. As the region’s preeminent trade event for the travel industry, Arabian Travel Market 2017 will build on the success of this year’s edition with the announcement of an additional hall as Reed Travel Exhibitions looks to add to its record-breaking achievements.